If you're searching for a great day of Halibut or Salmon fishing out of Homer, give us a try. Catching lots of fish is our business, but our primary objective is making sure you have a fun and safe day on the water that you will never forget. We are now fishing for winter king salmon all year as well. Click HERE for a slideshow of our 32' boat. More room & comfort all day! Homer is located at the southern end of the Kenai Peninsula about 225 miles from Anchorage. 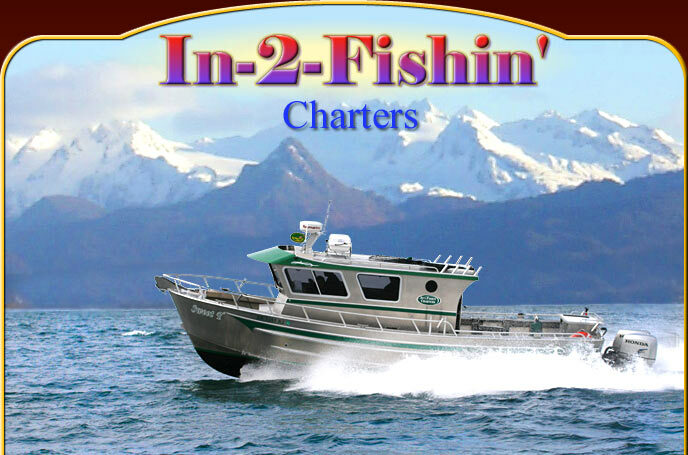 Daily trips from the Homer harbor put you on the fishing grounds in 45 minutes to two hours. We have no set hours for our fishing day, but most days run between 8 and 10 hours. If it takes a little longer to wear you out, that's no problem. The "SWEET T" is a 2008 Bay Weld all aluminum boat custom built right here in Homer. She is 32' X 11' with twin 225HP Honda outboards. We supply all bait, tackle, cleaning, and filleting. Semi-reliable answers will also be provided for all of your questions. We recommend you bring your Alaska fishing license, a king salmon stamp (if fishing for kings), food and beverages, warm clothing, a camera, video camera and lots of questions that only require semi-reliable answers.